Rated R wildly re-imagines the myths of the Chinese Zodiac Animals to encompass zany comedy and to dramatize serious social issues. In a post-apocalyptic world, the Zodiac gods suffer a crisis as their human underlings lose interest in reproducing. The Lark, a chirpy court entertainer who dreams of becoming the first Goddess, descends to the Earth to solve the mystery. Through the journey, she discovers her real passion and therefore, revives the world. Music and Libretto by Wang Jie. Instrumentation: Singers, Fl, Cl, Bsn, Hn, Tpt, Trbn, Tba, 3 Perc, Keyboard soloist: Hpsd (amplified)/Cel/Pno, Strings. 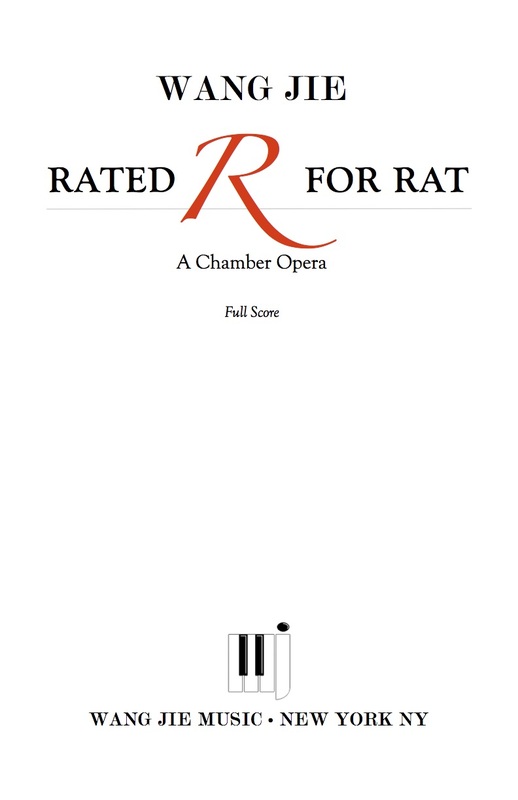 Rated R for Rat was commissioned by the American Composers Orchestra through the Underwood Commission Prize, American Opera Projects through an OPERA America Female Composers Commissioning Grant, and received its first workshop with assistance from the San Francisco Conservatory of Music Opera Program. American Opera Projects First Chance program receives support from The Andrew W. Mellon Foundation; Second workshop at Opera America’s 2017 “New Works Forum” in front of a national audience; Third workshop is scheduled on Sep. 30th 2018 at American Opera Projects featuring young artists from Lauren Flanigan’s Music Mentoring House. Re-discovering soulful music on earth, a Zodiac Goddess loses her place in the heavens to share her musical powers with mankind. On earth, humans are facing extinction under massive industrial waste. In their dire circumstances, they no longer procreate. Which means that in Heaven, the Zodiac Animal Gods struggle with their own crisis: their drug habits are fed by a by-product of human reproduction. This operation is headed by the supreme Rat, who long ago hired a sweet-voiced Lark as his court entertainer. The Lark, having catered to the Rat’s questionable musical tastes for thousands of years, dreams of a promotion to divinity. Sadly, her idealistic musical ambition is seen simply as daily entertainment by the Rat and his minions. In a desperate attempt to secure her promotion, she descends to Earth, hoping to reverse human extinction, thereby winning the Rat’s favor. Once there, the Lark encounters a dying peasant, who sings music full of longing. The peasant passes her musical gifts to the Lark. Little did the Lark know, the combination of her heavenly voice and soulful human music is key to reverse earthly devastation. Whenever the Lark sings the peasant’s song, healing occurs. This discovery should be the game changer for Heaven. But the Rat finds human music distasteful and trivial. The Lark is enraged. She quits her divine post and loses immortality. She can now sing freely and revive the human world. But her death is also near.